I can’t find one of my courses in Canvas! 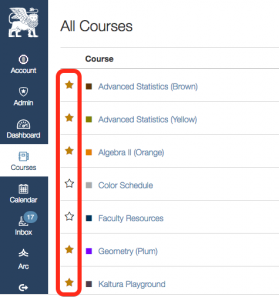 As we get started into the school year, you may discover that a course that you expected to see in your Courses menu is not, in fact, in your courses menu. Here’s why: you’re enrolled in a bunch of courses. Not every course is immediately germane to your interests and needs (e.g. everyone is enrolled in the Library course, but most of the time you’re going to end up there from the Library catalog). Canvas can only display a certain number of courses in your Courses menu and it’s trying to choose your courses “intelligently” based on the dates when those courses are (theoretically) active. 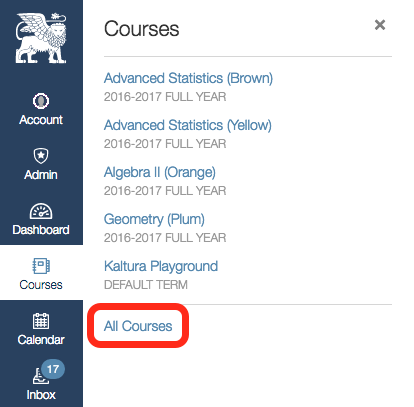 You can change which courses are showing in your Courses menu by following the All Courses link at the bottom of your courses menu. 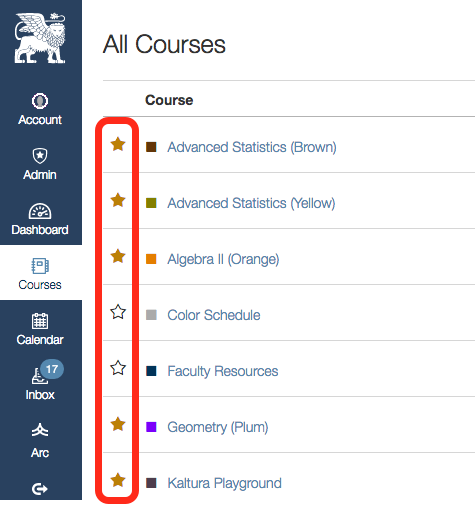 Then click the stars next to the courses that you want to see in your courses menu (your “favorite” courses have the gold stars next to them — it’s very sticker chart-esque). Caveat emptor: Some people have reported that their favorite selections are not “sticking.” If this is the case for you, please immediately Report a Problem from the Help menu in the top-right of your Canvas window. We are working on a pushing out some more intelligent “favorites” later today, but have not yet done so. I also was having trouble getting my courses to “stick” after I clicked the gold star. I found that if I clicked the star then clicked on the course immediately after from that same screen it then appeared in the menu, but not if I went back to my home page after clicking the star. This entry was posted in Students, Faculty and tagged Canvas, course, favorite, customize, Reviewed by Academic Technology 2016-2017.